Our YouTube Channel is where we share videos of students and schools from throughout our District. 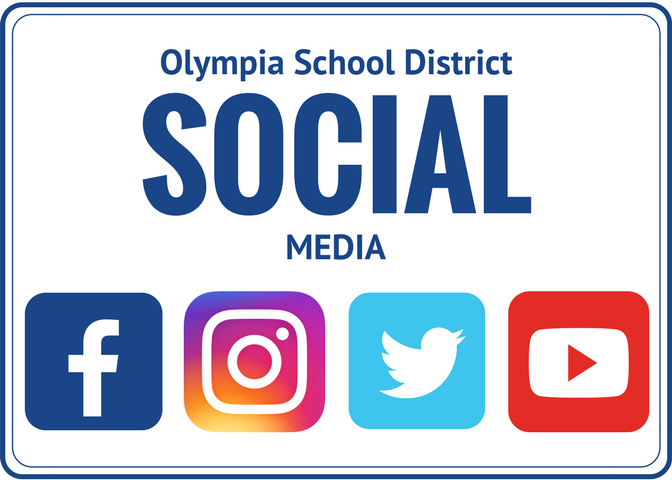 Be sure to “like,” “follow” and “subscribe” to stay informed about district news and events. Madison Elementary Fifth graders in Jessica Duncan’s class were recently treated to a very special “Book Tasting.” The purpose of the “Book Tasting” was to generate interest in reading and to select the first novel the class will read and discuss this year during literary circles as part of the Wonders curriculum. Duncan set the mood by projecting a roaring fire on the whiteboard, placing tablecloths and battery-operated candles on tables, dimming the lights and setting a place for each student complete with a menu, a book, a beverage and some tasty treats. Students quietly read a few passages from a book, engaged in thoughtful conversation about the story, and rated the book on a scale from one to five. A rating of one meant they were really interested in reading the book and a five meant this wasn’t the best book for them, but reading it may help them expand their genre interests. The class rated “City of Ember”, by Jeanne DuPrau; “Island of the Blue Dolphins,” by Scott O’Dell; “Tuck Everlasting,” by Natalie Babbitt; “Esperanza Rising’” by Pam Munoz Ryan and “Walk Two Moons,” by Sharon Creech. Madison principal, Domenico Spatola-Knoll said, "This activity checks all the right boxes! It’s educational, engages the students, and lets them have a say in their learning." After the book tasting, Duncan tallied the menus and “City of Ember” was selected as the class favorite! The entire class will read City of Ember together as they learn expectations and procedures for literary circles. During literary circles, students discuss books using various reading strategies learned in Wonders curriculum lessons. The “Book Tasting” was a creative way to “hook the kids and get them excited about reading,” said Duncan. In addition to this “Book Tasting,” Duncan creates other projects to enhance student learning. For example, “when Wonders has us compare and contrast characters we draw large outlines of the characters, put them up on the wall and write information from the text using test based evidence to prove our thoughts,” said Duncan. We can’t wait to hear all about “City of Embers” and the other books Madison fifth graders will read this year. We’re sure they will all be delicious! The Olympia School District is pleased to offer free parent education workshops with Candyce Lund Bollinger. 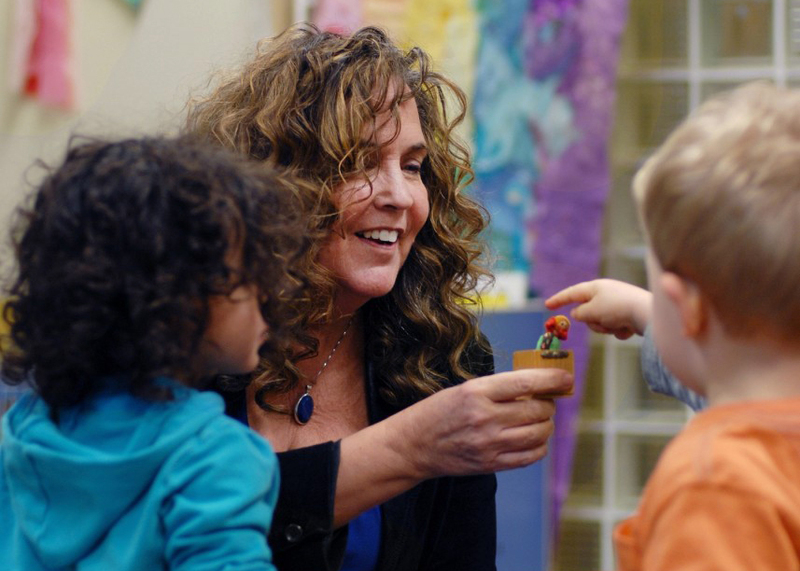 Bollinger is a parent educator and private parenting counselor in Washington State and has been practicing for more than 35 years. She provides classes and consultations for schools, colleges, civic groups, private organizations and has a private practice. She is the mother of four children and has two grandchildren. 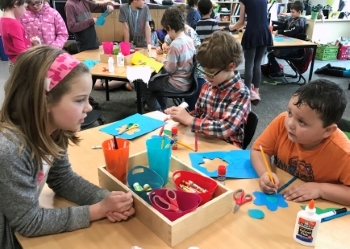 This is the third year of the visual arts program, which started in 10 elementary classrooms and has been expanded to nearly 40 classrooms throughout the district’s 11 elementary schools. Art docents are trained to deliver an art lesson once or twice a month while assisted by staff members. Each art lesson is between an hour and 75 minutes long, and lesson-specific art supplies are provided to classrooms ahead of the scheduled presentation for the docent to use. The art curriculum features engaging and easy-to-follow lessons. The district offers convenient and flexible schedules for docents, who are trained by Kirstin Holstrom, an art teacher at Washington Middle School and creative director of the visual arts program. Volunteer art docents begin in late October and end in May. If interested in volunteering, please contact Holstrom at kholstrom@osd.wednet.edu. Join us for a presentation by the Olympia Police Department on ‘Sexting’ and online ‘Harassment’. This presentation is currently being given by the OPD to all sixth, seventh, eighth and ninth grade students in the Olympia School District. When: October 5, 2017 from 5:30 - 6:30 p.m. This presentation is free to all Olympia School District Elementary and High School parents. If you have any questions please contact School Resource Officer Kim Seig at (360) 239-0763. October is International Walk to School Month, and the Olympia School Board will consider a proclamation on September 25 recognizing October 2017 as Walk to School Month in the Olympia School District. When safe walking is available, students are encouraged to walk or ride bikes to school to improve their health, increase readiness to learn and learn about pedestrian safety. Several of our schools have committed this year to participating in Intercity Transit’s Walk N Roll to School Days. The first Walk N Roll event kicks off on Wednesday, October 4. We also want to remind motorists to slow down and observe the speed limit when driving in and around our schools. Thank you! Thurston County Medical Reserve Corps will host a Back-to-School Immunization Clinic at no cost for students entering pre-school through 18 years of age. Where: Kaiser Permanente Olympia Medical Center, 700 Lilly Rd NE, Olympia. For more details please view the immunization clinic flier. The American Association of University Women (AAUW) Olympia Branch recently selected six local rising seventh grade girls to sponsor at the 2017 residential Tech Trek STEM camp held at Pacific Lutheran University in July and Eastern Washington University in August. This is the first year the AAUW Olympia Branch has funded the opportunity through generous individual contributions. The attendees this year were our very own Brooke Christensen and Ava Wolin of Washington Middle School, and Kayla Quesnel and Iris Benge of Reeves Middle School. The STEM camp features hands on science and technology with opportunities to meet inspiring role models in a unique college experience. It provides an environment in which girls can learn about careers in Science, Technology, Engineering and Math. The Tech Trek program started over 15 years ago in California. It has since expanded into four additional states, including Washington, after organizers noted the program's effectiveness. Tech Trek alumnae are more likely than their peers to take advanced science and math courses and attend college. The AAUW is the nation’s leading voice promoting equity and education for women and girls. Since our founding in 1881, AAUW members have examined and taken positions on the fundamental issues of the day — educational, social, economic, and political. The AAUW is planning to continue this program and encourages middle school girls to apply. Visit the AAUW website for additional information on the Tech Trek program. Classified School Employee of the Year. The program recognizes the work of classified staff members who have made a positive difference in their profession. All school and support building employees who are categorized as “Classified” staff are eligible for nomination. Nominees should be employees who consistently demonstrate outstanding work performance, professional leadership and collaboration. Please complete the online nomination form and submit by 4 p.m on Thursday, October 5, 2017. A committee will review the applications and select the individual(s) to be recognized. The individual(s) chosen will be eligible to compete for the regional Classified School Employee of the Year selection process. The winner at that level advances to the state Classified School Employee of the Year selection process.